It’s inevitable. 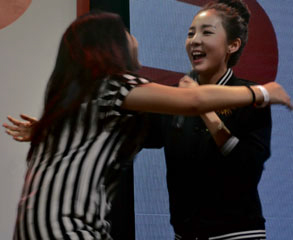 When you’re interviewing Sandara Park, you will end up switching to Tagalog. It shouldn’t be a surprise, really, because long before she became 2NE1’s Dara, she was the Philippines’ “Pambansang Krung Krung,” who first stole hearts with her tearful Star Circle Quest audition. Penshoppe flew Sandara to Manila last week for a series of events. “Even while still at the airport, I already felt like ‘I’m home!’ When I got off the plane, a lot of people were already calling out to me, ‘It’s Sandara, it’s Sandara.” Wow, I’m back.” she told members of the media at her press conference. “Dara’s fun and quirky personality and take on fashion represents very well what Penshoppe stands for,” said Jeff Bascon, Penshoppe’s brand director. It’s remarkable how real, grounded and endearingly unassuming Sandara has remained despite her fame. 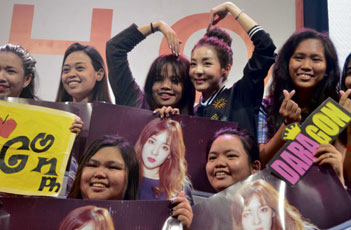 “This is Sandara,” she introduced herself, first at the press conference at Edsa Shangri-La Hotel and then later that day at Penshoppe’s DenimLab fashion show at Trinoma’s Activity Center, as if they didn’t know who she was, like she wasn’t the reason people had flocked to the hotel and the mall in droves, like she wasn’t the cause of their fervent screaming. She showed her gratitude in many ways. First, by accommodating 50 more fans for the meet and greet than the originally planned 100, gamely posing with them and greeting each one with hugs and her trademark warmth. And then by making the effort to get out of the car to say hi to the fans who weren’t lucky enough to get inside the venue and who had waited for her for hours outside. INQUIRER: How does it feel to be back in the Philippines? INQUIRER: You’ve worked with Penshoppe for a while now, what do you like about the brand? DARA: First of all, I like the clothes and the people at Penshoppe are very easy to work with and hardworking. Every time we have a photo shoot, the concepts are really good so I enjoy it a lot. INQUIRER: Do you have other favorites from the new Penshoppe collection? DARA: Earlier I got the wide-leg and pants and cropped paints… Their jeans have a lot of various styles. I wear them with T-shirts, simple T-shirts with sneakers. INQUIRER: Are you excited about the meet and greet tomorrow? 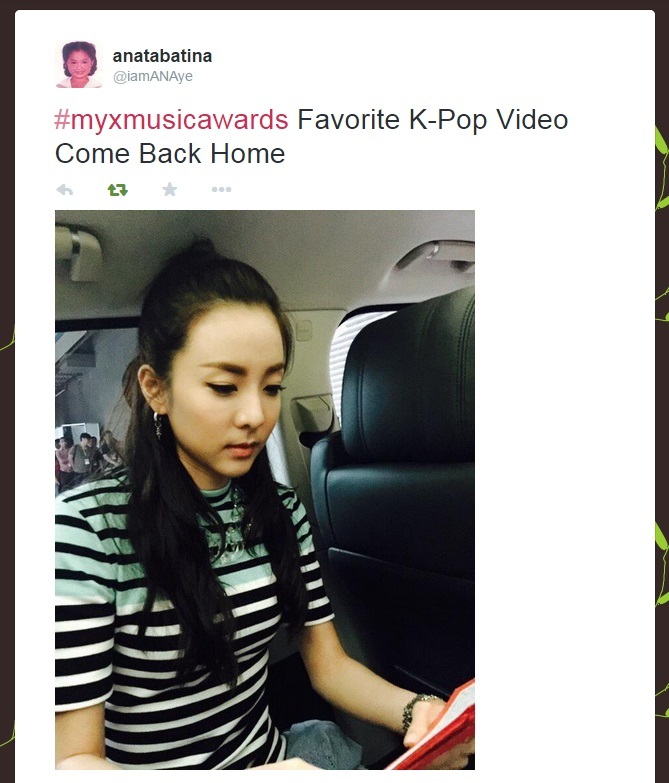 DARA: Of course! I’m excited but so nervous at the same time. I texted the manager of Mario Maurer earlier and asked, ‘What do you usually do during meet and greet?’ and the manager told me, ‘We play and take pictures,’ so wow, I’m really, really excited. INQUIRER: Do you know some of the fans who will be going tomorrow? DARA: I know them, I know their faces, I saw them earlier during the press con. I’m expecting them (to come) tomorrow, and the new (fans) as well. INQUIRER: Your Filipino fans are incredibly loyal, what would you like to tell them? INQUIRER: How long are you staying on this trip? DARA: Only for four or five days. Because I have a TV show in Korea called “Sugar Man,” and the taping/recording is every Wednesday. INQUIRER: What other projects should your fans watch out for? DARA: My upcoming movie. I would also like to try different things like Koreanovela (K-Dramas). INQUIRER: Tell us about the movie. INQUIRER: I know you always meet up with old friends, what else are you doing on this trip? DARA: I’m planning to meet some of my friends, but aigoo, I hope that the others don’t get upset with me, because I have a lot of friends but I don’t have the time to meet all of them. But I’ll come back. I realized that Korea is really near the Philippines anyway, just three hours and twenty minutes. I can come back any time I want. INQUIRER: We know you love Filipino food, what was the first thing you ate when you landed? 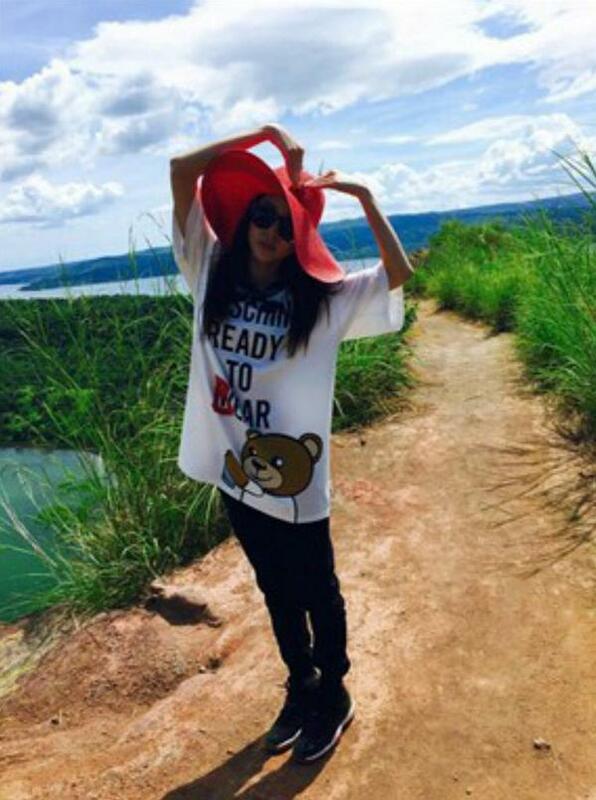 DARA: Yesterday? First, someone gave me Jollibee’s peach mango pie. So I ate it at once. Then after, we went to Luneta Park and I ate sinigang and sisig. INQUIRER: What else do you want to eat on this trip? DARA: There’s a lot. But I’m sure I’m going to eat sisig and sinigang again. 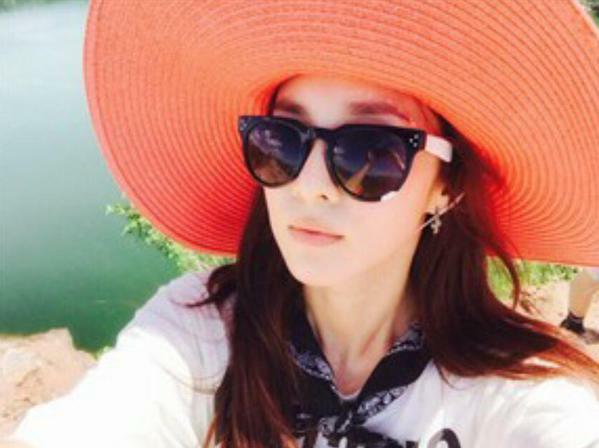 It’s Showtime: Sandara Park plays TrabaHula! In the video, the guys were asking what Dara could advice them as she is part of a group. The boys are part of a dance group called Hashtag. “Friendship is important. So, don’t fight. Even though sometimes you’ll get upset, but I know you love each other.Having fun is also important. Thank you for always being kind and you really love the Philippines. I know you miss being here very much and I hope you can comeback soon and God bless you more.